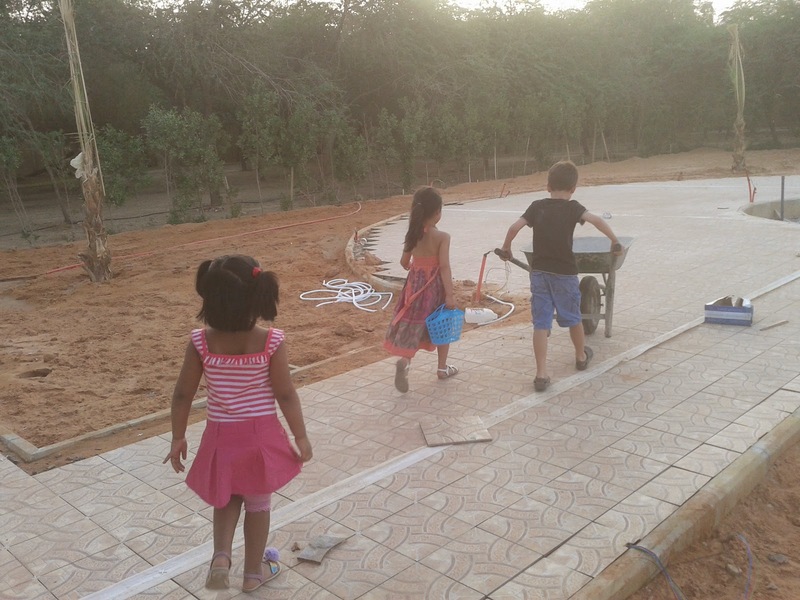 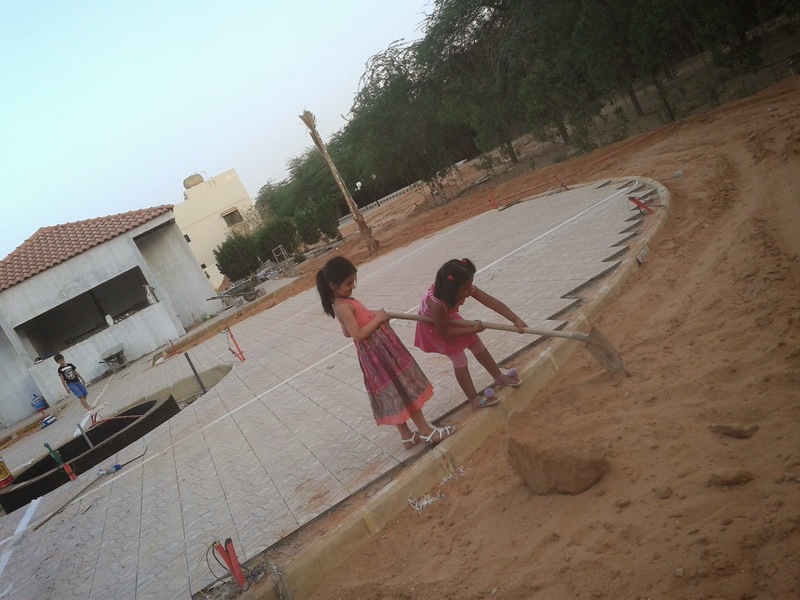 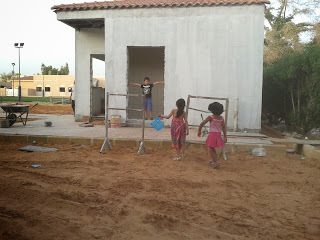 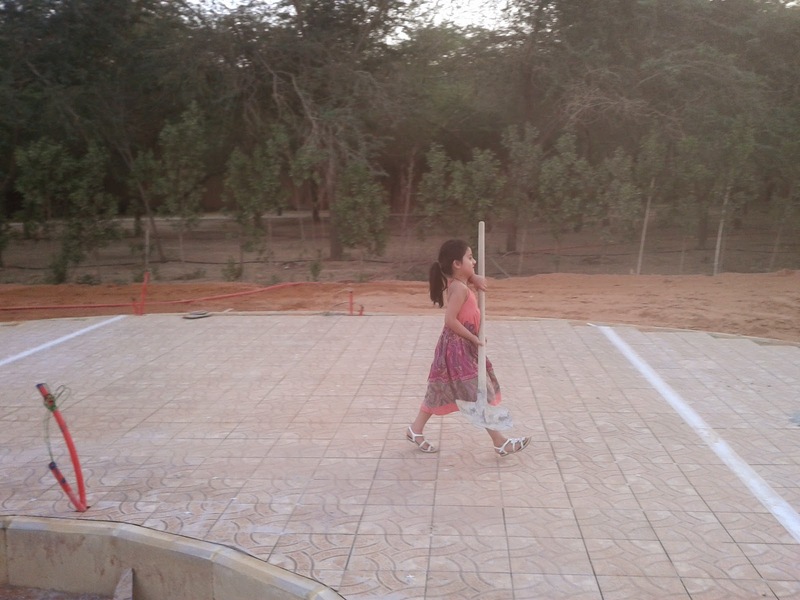 It was a wonderful afternoon when Nermeen decided to go to the woods area inside their Residential compound. when we were heading towards that area, she shouted, "what's that ? 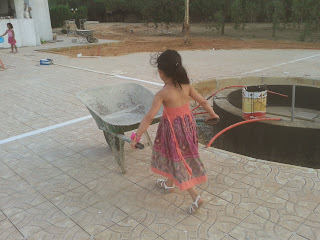 looks like an amazing place". 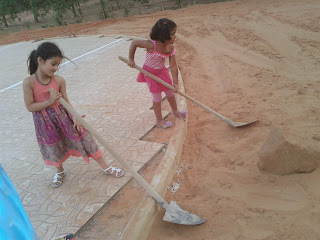 Playing with it in many ways till they discovered that it need to be handled in a specific way . 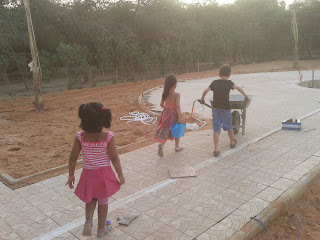 After some initial conversation, they decided who was going to start moving it around. (They handled it in a beautiful manner without an adult intervention). 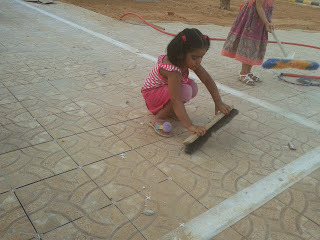 The best part was to get control of the wheel and have a perfect balance, so she did it quite nicely. 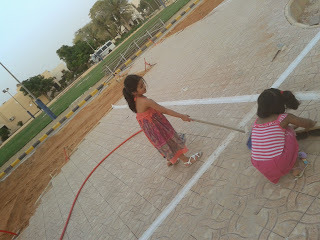 After applying 'trial and error strategy' , she got the right kind of control all by herself. 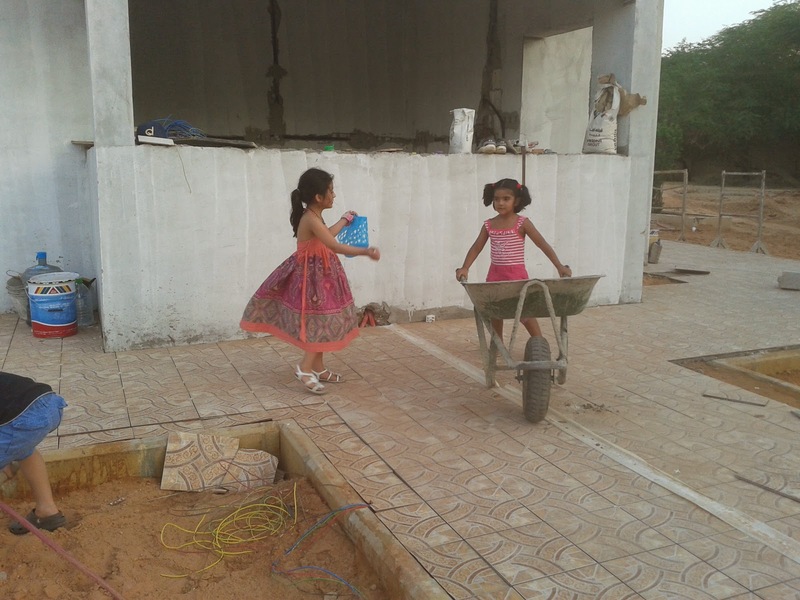 Now it's time for her Spanish friend Giamo to take over the wheelbarrow, and he learned something different focusing on how to hold it in a manner when applying speed. (the boy's way of learning). 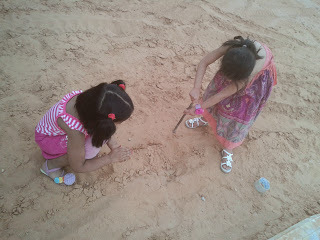 Her friend was little reluctant to try, but Nermeen convinced her to give a quick try. 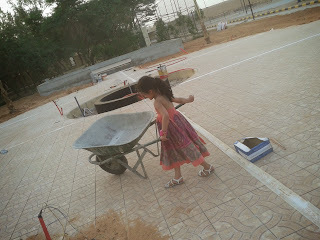 And then she was just enjoying the moves and the excitement of handling such a big stuff. 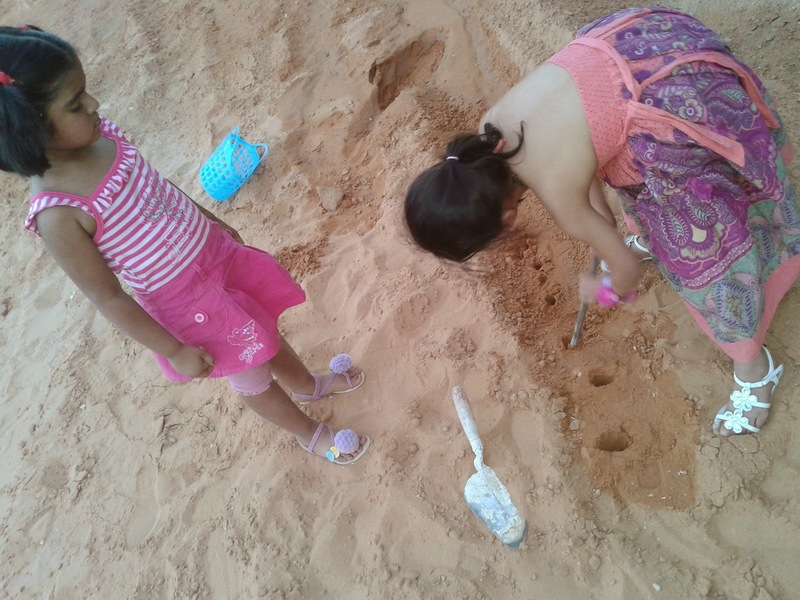 Children are always curious to know why things happen? 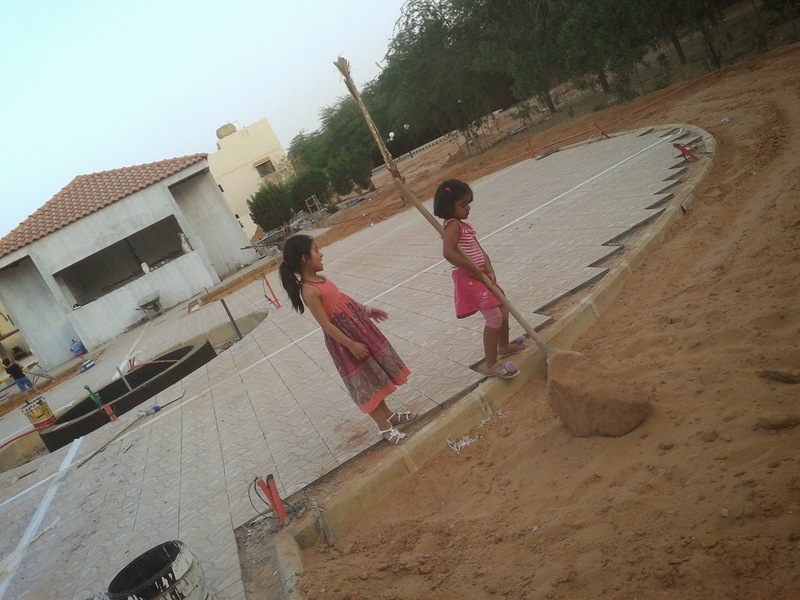 what's the cause and effect relationship? 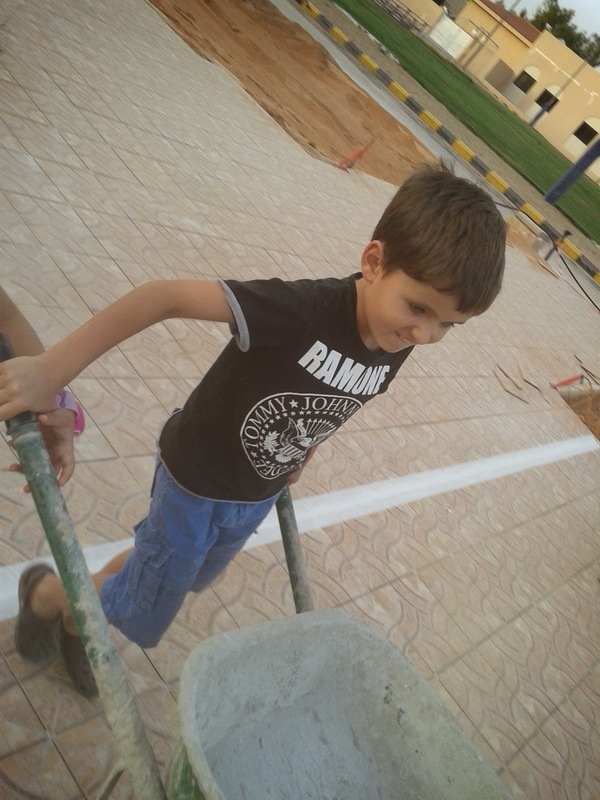 how it can be done? and when they are through, they feel the sense of achievement which inspires their souls ,brighten their neural connections and finally leads them towards more Exploration. 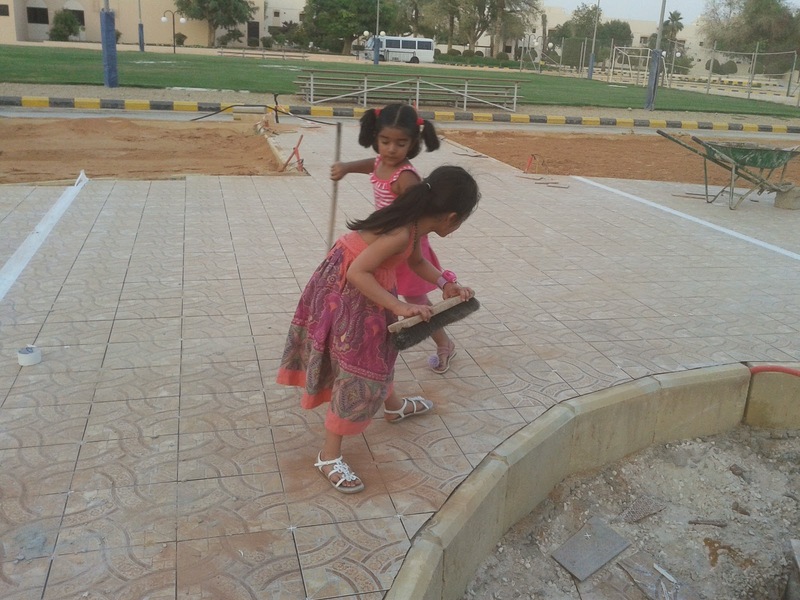 After watching him , Nermeen and her friend decided to try the showel too. They actually saw him handling it perfectly so they imitate it but adding their own way of connecting with the showel and sand. 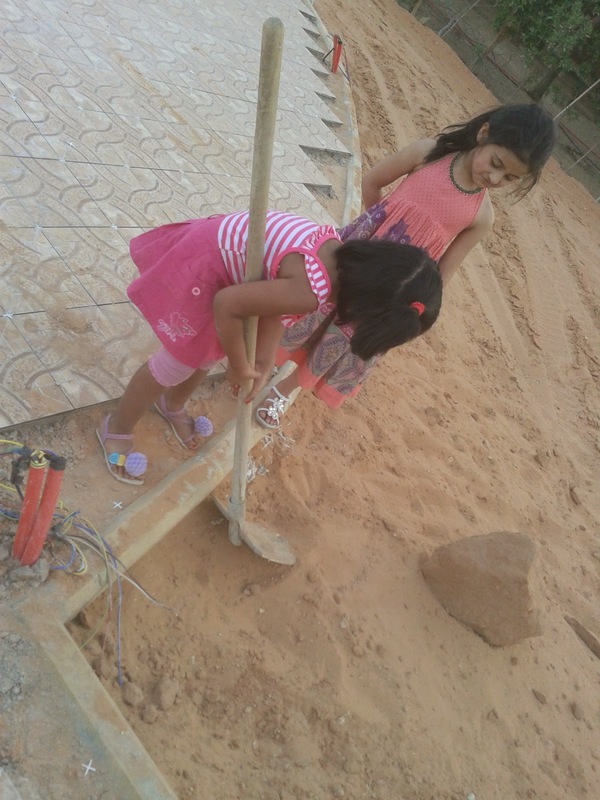 Soon they were using two different showels. 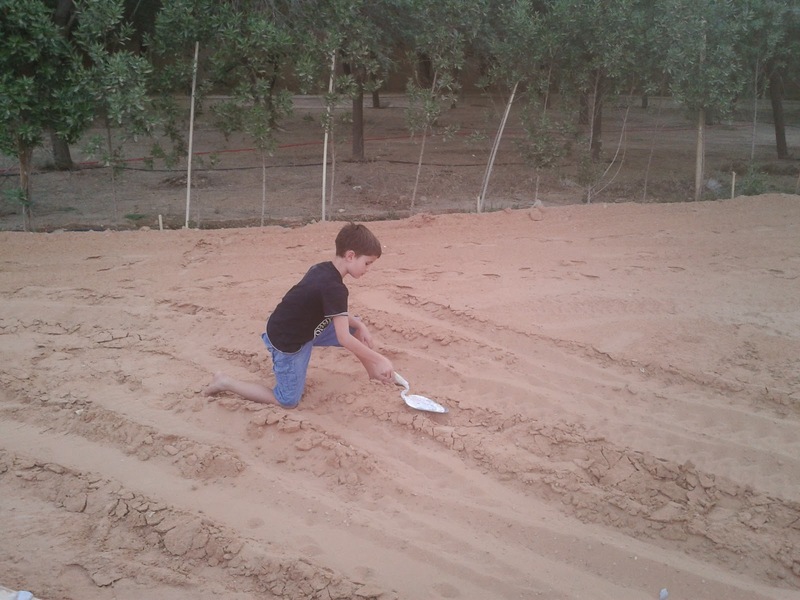 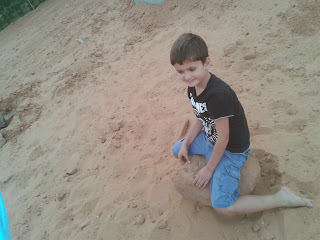 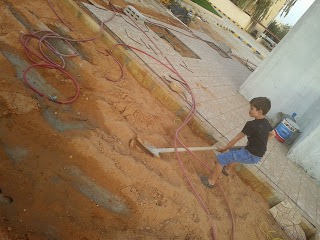 While the girls were there on the sandy area ,this boy started exploring other areas and tools. He asked me whether he could jumped into that circle area where he saw some Tubs of Paint. 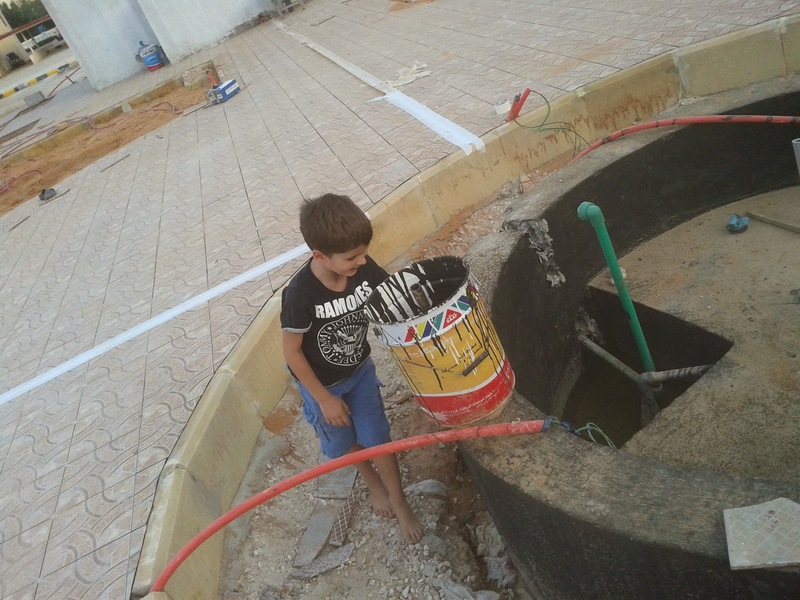 He discovered the mixture of paint and realized that it contained water and that's how its looked like a 'liquid'. Inside there was a water reservoir, he sat there messing with the sandy water and ran away to tell his friends about his new discovery. 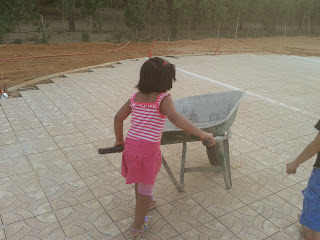 She found a Trowel and ready to work with. 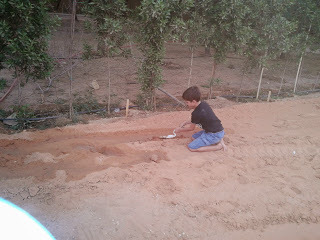 Everyone was using it for their own discoveries, he was trying to level down the soil. He brought a bucket of water ,poured it down and then tried his trowel again only to discover some more facts about soil, water, spade and their relation with human 'hands'. 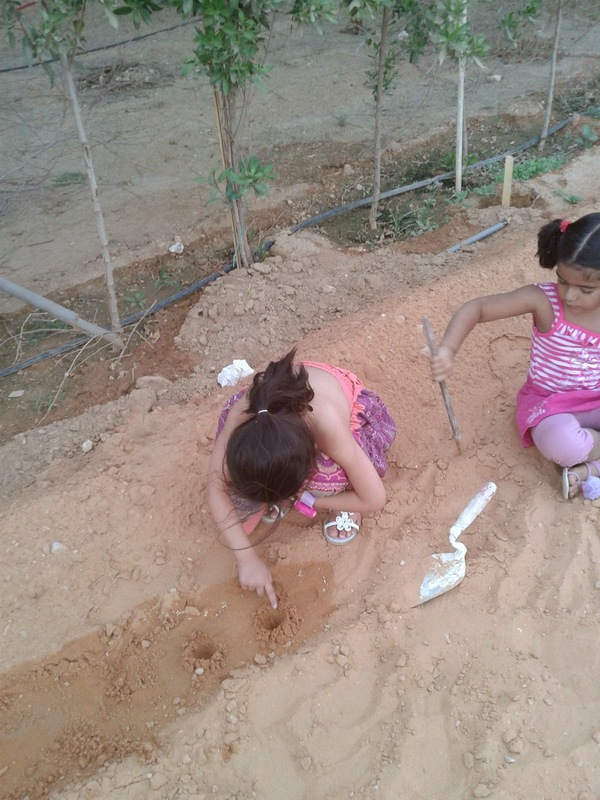 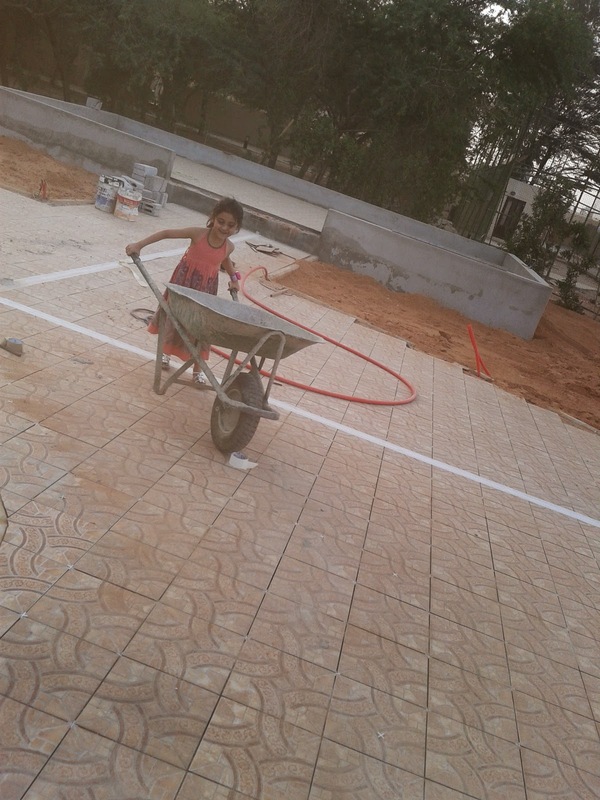 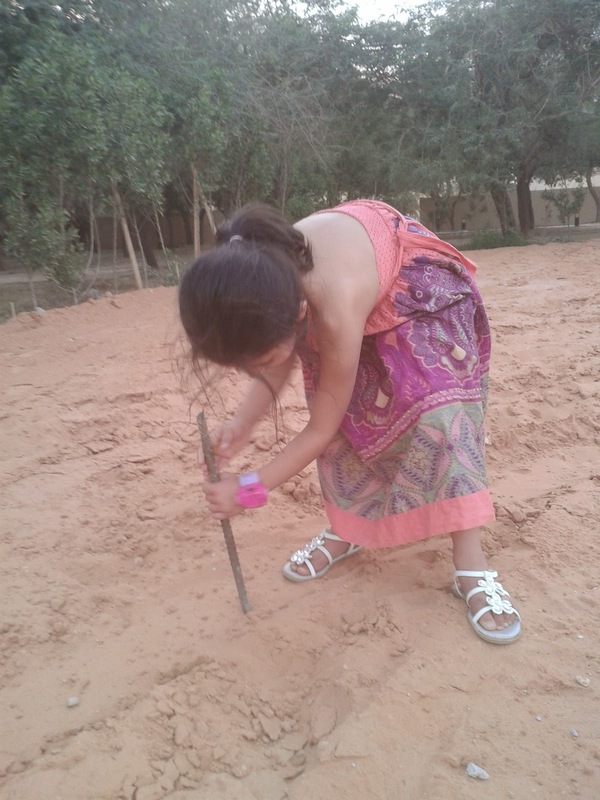 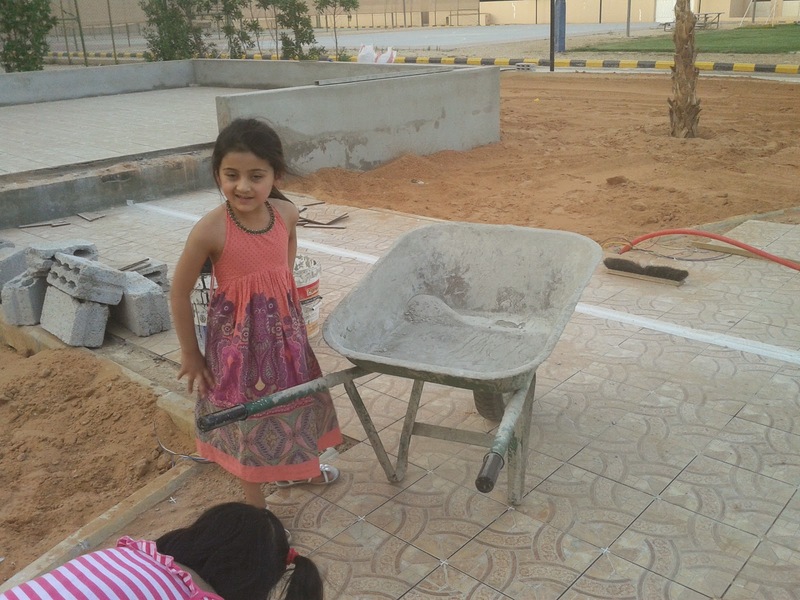 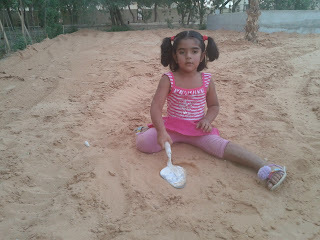 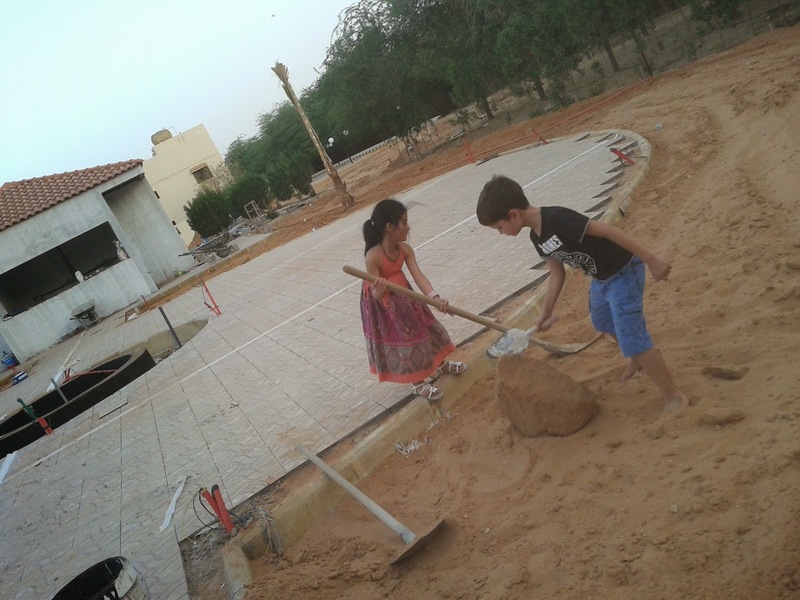 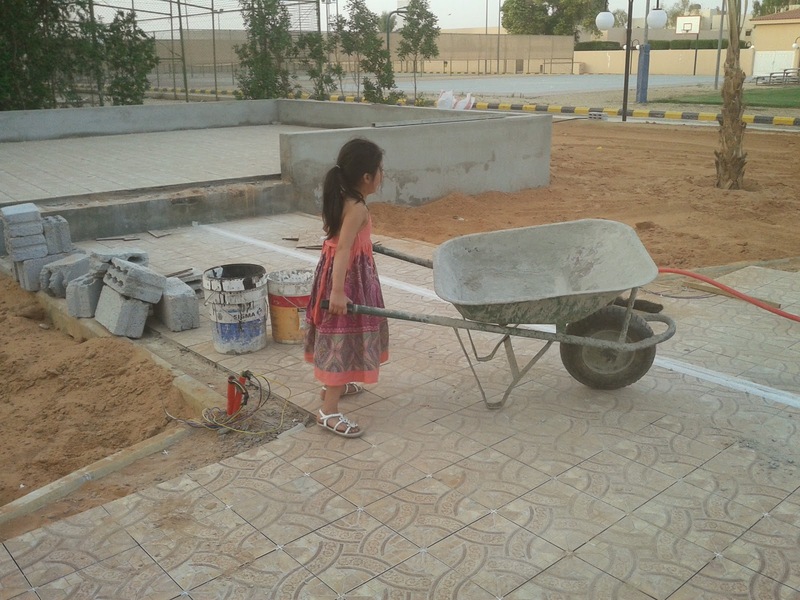 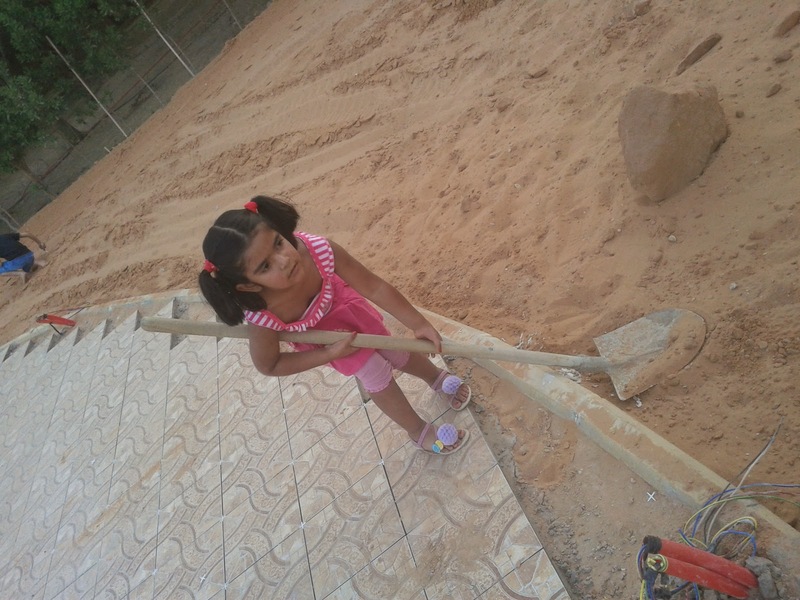 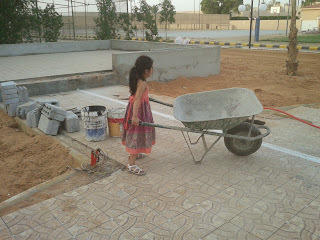 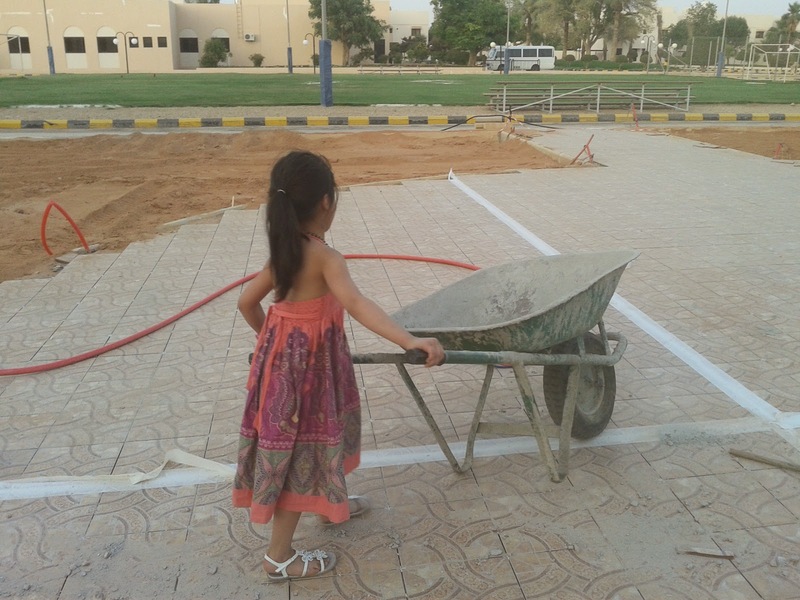 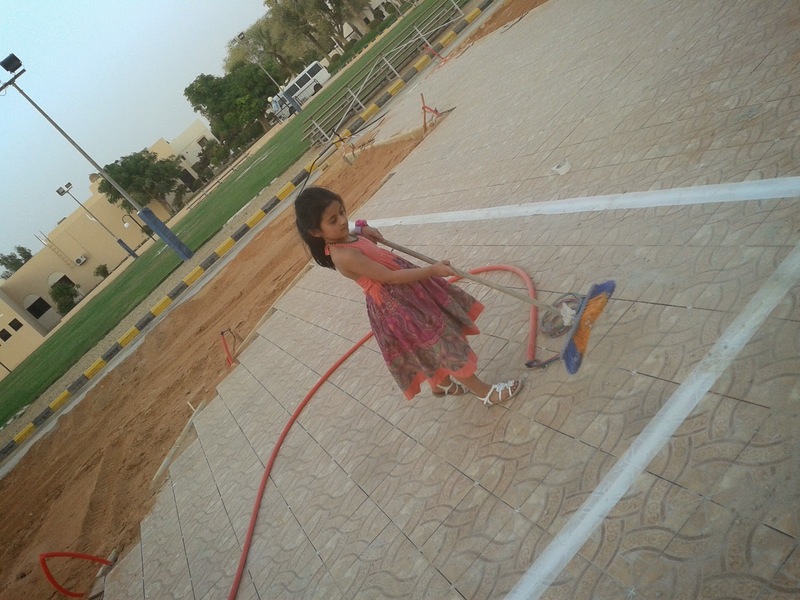 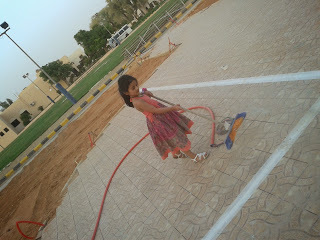 Nermeen found a steel rod ,fascinated by it's shape, she started inserting it in the soil. 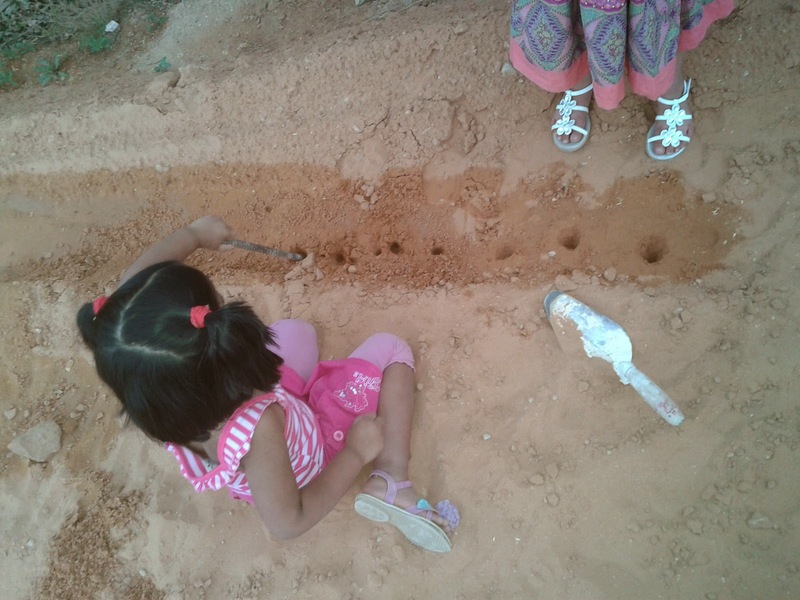 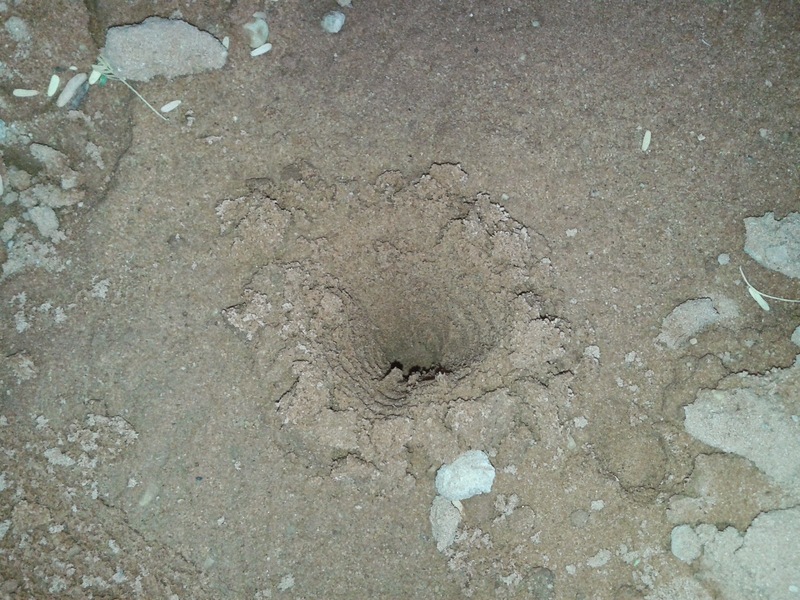 Because, she couldn't see holes clearly which started appearing on the soil, she brought the spade ,leveled the soil and then tried the rod again only to discover the amazing 'holes'. 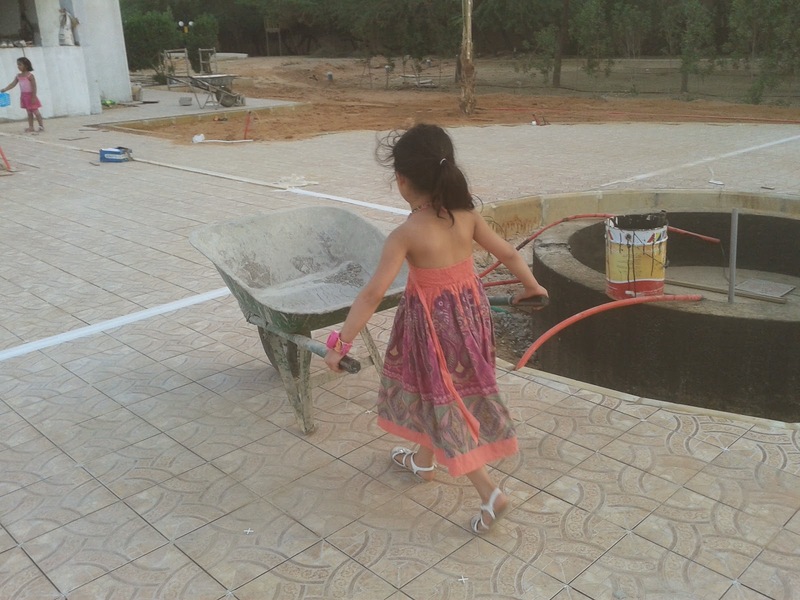 A child feel curious and excited at the same time when he discovers the relationship between what is being done and what is coming out of that process of 'doing'. They decided that one child would be leveling the soil with the hand while the other would make the holes. the repetition of the activity that the child will gain mastery and learn the concept". To make it more obvious, they decided to pour the water on the soil before leveling it. After exploring many tools and areas it's natural for children to search for some cleaning stuff. 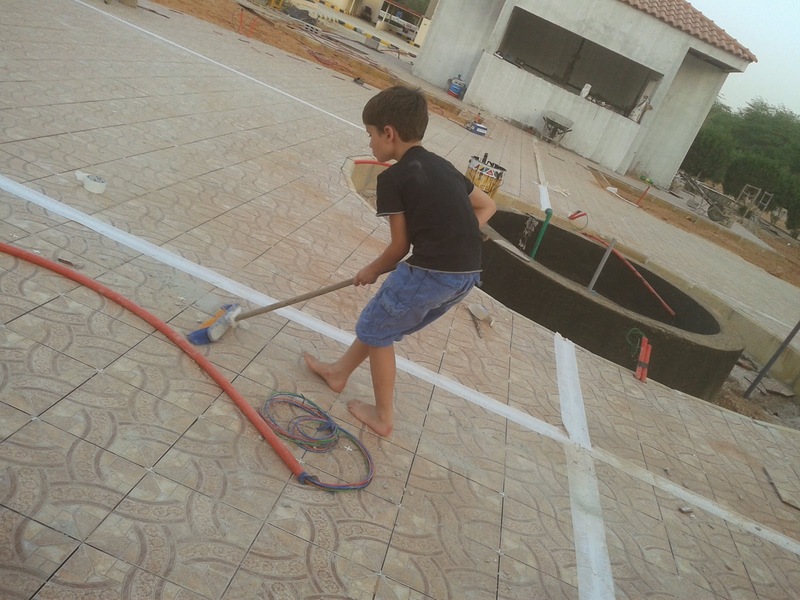 This boy found a broom and started cleaning the place full of dust. 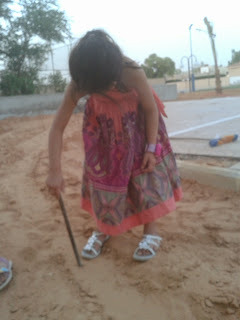 Nermeen and her friend found some broken brushes . Children are always creative problem solvers ,what they need is a fertile land to grow. "Education is not something which a teacher does, but [is] a natural process which develops spontaneously in the human being. 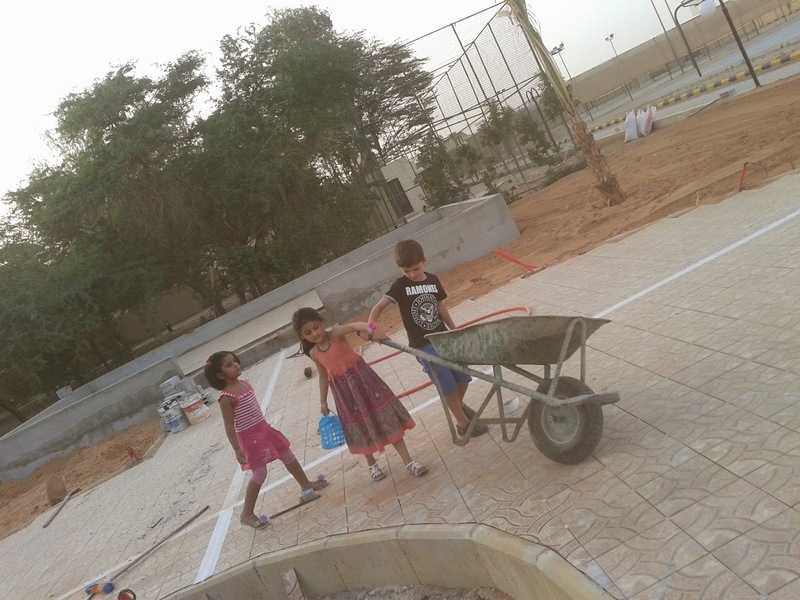 It is not acquired by listening to words, but in virtue of experiences in which the child acts on his environment. 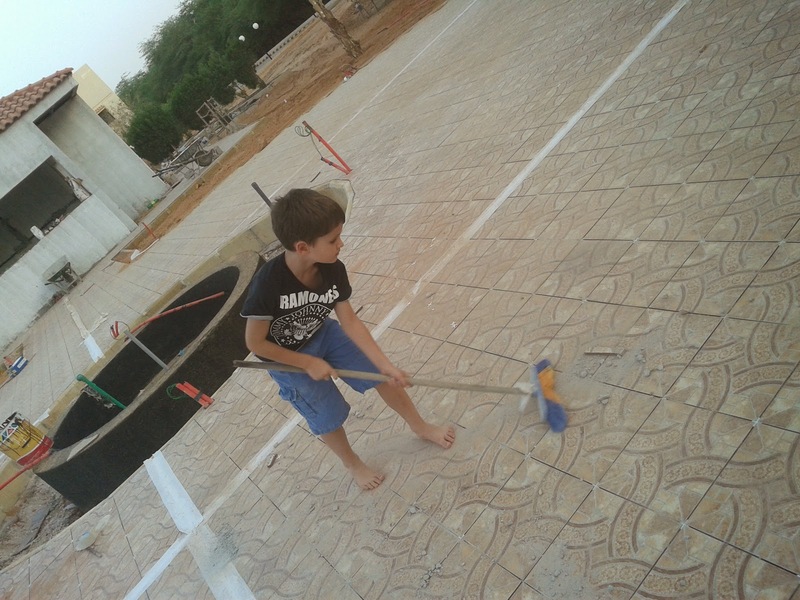 The teacher’s task is not to talk, but to prepare and arrange a series of motives for cultural activity in a special environment made for the child".